London Days: Faux Metal Joy. I just swapped these elements around and instead of the black die I gave a little nod to the black by adding a few sequins and gems. 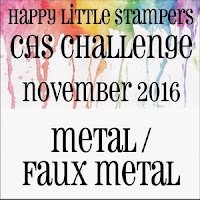 The 'Joy' element is made using the 'faux metal' technique I learnt from watching this video I found on the challenge this month on Happy Little Stampers CAS Challenge. I actually didn't think I would have the patience to do this but...shock, horror I did! I actually even dry embossed the faux metal before I die cut the 'Joy' to give it a more metal appearance. Wonderful interpretation of Kimberly's card, Sandie. I love the star with the splatters surrounding it. 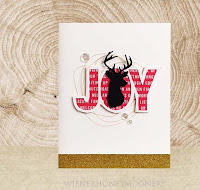 The texture of the JOY is so fab, and the splatter star is so festive!!!!! !this is a party on a card!!!! 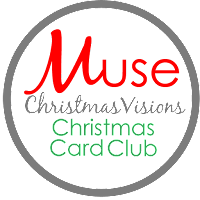 Thanks so much for joining us at MUSE Chiatmas Visions!!! Awesome - the dotted star and the big, bold sentiment! So sweet...love your gorgeous star!!!! This is a super card. I really love your faux metal 'joy'. Thank you, Sandie, for the video... what a treat, as is this joy-filled card! Cool and contemporary, festive but also ideal for other occasions, I love that about this design, so versatile. Love that star, Sandie and the bold joy! So great to see you at MCV this week! Great CASE of Kimberly's card--love the copper Joy!